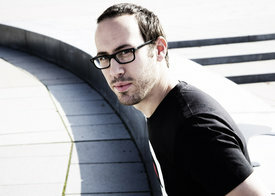 Yaron Herman was born in Tel Aviv on 12th July 1981. He started out on a promising career as a basketball player on the Israeli national junior team but a serious knee injury cut short his sporting ambitions. He only decided to take up playing the piano at the age of 16, with a method based on philosophy, mathematics and psychology. Totally unknown 5 years ago, Yaron Herman is now considered as one of the best young pianists of his generation. In 2007 his first trio album „ A Time for Everything” received critical acclaim winning “Choc Jazzman” of the year and “Disque d'émoi Jazz Magazine”. In September 2008, Herman won the award for best new instrumentalist of the year at the “Victoires du Jazz”. Both the media and his audience are very enthusiastic about him, not just in Europe but also further afield in Asia and North America. His popularity and his dazzling career to date confirm that he is an exceptional phenomenon, unique in the history of piano playing. "Follow the white Rabbit" is Yaron's invitation to his first album on ACT, a reference to the mischievous character from Lewis Carroll’s story, who leads Alice on an amazing journey down the rabbit hole into Wonderland. Yaron's Wonderland is all about music and piano. Without conceding to any particular facility, he knows how to abolish the conventions of musical genres, blurring the tracks and the boundaries of jazz improvisation, pop and classical counterpoint, all with an impish glee. Yaron's wonderland is an uninhibited novelty world, full of freshness, which seems to flow with an inexhaustible energy. Accompanied by the groovy Chris Tordini on bass and the swinging Tommy Crane on drums, the chemistry of this cosmopolitan trio is apparent from the very first notes, just as when they first met during a tour in Canada earlier in 2010. This immediate connection naturally led the trio to the studio to record this album, an adventure that will continue in the upcoming months with an impressive series of concerts. The “white Rabbit” has a bright future ahead of him, and with this album Yaron Herman confirms more than ever all the hopes and promises that were born of his previous records. This young generation of musicians is reinventing a beautiful landscape, with Yaron Herman on the crest of its wave. He is exploring a field of endless inspiration and magic, of unexpected synthesis from Radiohead to Nirvana through the classics of Walt Disney, or by borrowing standards from Israeli folklore, or giving free rein to his inspiration of the moment, captivating compositions written as pop standards. This trio knows how to assimilate all the influences, all the energies, all the playgrounds of their time to reinvent their own musical language, one that is original, sincere and full of emotion. A real magic trick!